Versailles is a town of nearly 90 thousand inhabitants and is situated in the Île-de-France region. 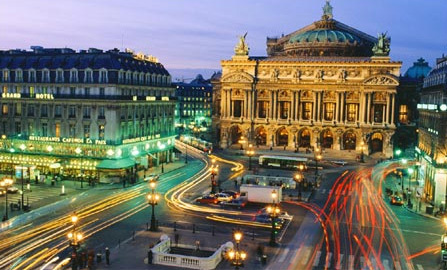 It lies about 20 kilometres to the south west of the magnificent French capital, Paris. Originally, the land was used for agricultural purposes. However, in the 17th century, during the reign of the French kings, Louis XIII and Louis XVII, it was turned into the setting of a splendid summer residence where the royal family could decamp in order to escape the oppressive heat of the capital. It was only during the reign of the younger Louis, the XIV, that the site which had initially been a summer residence was transformed into the vast and truly spectacular palace of the Sun King. It wasn't long before the royal family moved to Versailles all year round and this then became the nerve centre for all things political and economic as well as being the nucleus of unbridled luxury for the French aristocracy from 1600 onwards. Even today, for those who are visiting Paris, it is impossible to miss out on the opportunity of paying a visit to the magnificent Palace of Versailles. This is where the sumptuous grand fête known as The Pleasures of the Enchanted Island was held in 1664. The Sun King organised ballets, knights on horseback and Moliere's troupe of actors to entertain his 600 guests in celebration of the court's removal from Paris to Versailles. It was no accident that this became the Sun King's official residence as it was here that he was able to indulge such extraordinary excesses as canopied beds, decorative finishes in gold leaf, chairs, jewels and furnishings that were made from the most precious metals and adorned with precious stones. A vast museum housing more than 6,000 paintings, 15,000 drawings and more than a thousand sculptures. One really shouldn't visit France without paying a visit to the famous Palace of Versailles. Every year, thousands of tourists patiently join the interminable queues for access to the palace which has now been declared a UNESCO World Heritage Site. Although there are daily bus and shuttle services which move the numerous tourists from Paris to Versailles and back, the most comfortable and convenient way to visit the wonders of this palace can be found on the web site: taxileader.net. Via the "Tour Versailles by Car Service" and a simple reservation form, you can book your trip to this city in advance, giving you complete peace of mind. You can choose the type of transport, the size of the vehicle required and the duration of the tour. Through this simple method, not only will you avoid the never-ending queues to try and get a taxi on the streets of Paris and the stresses of public transport but also, you will avoid the complexities of different schedules and timetables that apply to the public transport networks. What is included in the Tour of Versailles Service? The private driver who will be at your disposal via the Tour Versailles Service from taxileader will be responsible for coming to collect you straight from your hotel or at the doors of the airport terminal at which you arrive in the city. Your luggage will be loaded into the vehicle and you will be driven directly to what many people describe as one of the great wonders of the world. In addition to this, you will only have to pay the remaining balance for the cost of the service. How long does the tour by car last? It is possible to book a Tour of Versailles by car that lasts for either four or eight hours, according to the customer's requirements. When the eight hour tour is selected it is also possible to use some of the time available for a tour of the city of Versailles and the rest of the time touring the centre of Paris. Only a small deposit is required in order to secure the service which can be paid either by credit card or with a pre-payment. The final account will be settled in cash directly with the driver at the end of the tour. In other words, you can enjoy your visit without any stress, without having to share your transport with other people and without having to endure long waits. Choosing to book the Tour Versailles Service means that you have organised a visit to one of the places that has contributed to the making of French history and has been the threatre of some of the most important successes of mankind.